The TGIF Edition that went out to subscribers Friday can now be read here. Winston Peters has allegedly been caught lying to Parliament and the Privileges Committee. I say 'allegedly' because to do otherwise requires a presumption that Glenn is entirely correct. Glenn's memory has of course been challenged on his previous claims about being offered cabinet positions. Nonetheless, if true, Peters must go. Unlike last issue, this one is not complimentary...but a $3 subscription will get you covered not just tonight but for the next four weeks. KANSAS CITY, Mo. - Admit it. You want to believe. The same way you want to someday comb a unicorn's mane, chat with a leprechaun and (for our kiwi readers) watch the All Blacks win a Rugby World Cup, you'd like to think that these guys claiming they will unveil a real Bigfoot this weekend aren't full of Sasquatch dung. Yet (or is it Yeti?) the chances don't look good. We - the 13-year-olds in all of us that pine for better video of the Loch Ness Monster and for a look at the water-powered car the auto executives killed - have been pulled in before. And we haven't so much as a tuft of genuine Gigantopithecus blacki fur to show for it. There is that 1960s video of the big guy strolling through the woods in a bad gorilla suit. The various footprints. The Bigfoot blood that turned out to be transmission fluid. The hair that was just carpet. Now come at least three men - coincidentally all in the Bigfoot business - promising evidence at a weekend news conference in Palo Alto, California, that the elusive mannish monolith has been found at long last. "A body that may very well be the body of the creature commonly known as 'Bigfoot' has been found in the woods in northern Georgia," says a news release. It describes the carcass as that of an animal 7 feet 7 inches tall, weighing more than 225 kg, that "looks like it is part human and part ape-like." The two who claim to have found the mysterious beast in north Georgia - a former cop and a former prison guard - offer Bigfoot expeditions. They have teamed up with Tom Biscardi, who has been searching for and making movies about Bigfoot since 1971. He says that he has had at least six encounters of the hairy kind and that he has landed in the area of sightings by others on several occasions. In March, for instance, he took a film team to Bishopville, S.C., after locals saw what they called a "lizard man" and that he suspected - "you've got the real deal here" - was Bigfoot. Two years earlier he sued the Great American Bigfoot Research Organization over possession of a plaster cast of what was presumed - by those fighting over it, anyway - to be Bigfoot's big footprint. In 2005 he set up a pay-per-view broadcast over the Internet of a Bigfoot expedition near Happy Camp, California, after suspected sightings in the area. Now he's promising "DNA and photo evidence" that the missing link is missing no more. 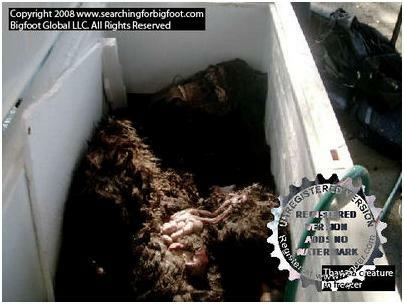 A picture is already up on his Web site - essentially a freezer full of something brown and furry. "This smacks of Hollywood, not science," said a weary Benjamin Radford, the managing editor of Skeptical Inquirer magazine and a lead author of Lake Monster Mysteries. He puts little trust in either Biscardi or the Bigfoot legend. Biscardi has spoken confidently about evidence before. Radford said the prospect of a very large animal and its kin existing without discovery in North America defies logic. In fact, the term "Bigfoot" was coined when California construction company owner Ray L. Wallace donned 40-cm wooden feet and tromped through mud. That spawned a front-page article in the local newspaper and gave name to the legend of Bigfoot. Ever since, there have been low-budget documentaries, self-published books and countless Web sites devoted to Bigfoot as reality. Sightings have been made from Pikes Peak to Louisiana, Missouri. Biscardi said in a brief interview Thursday that he had invited two Russian scientists - "because they're the two most prominent in the field" - to do an autopsy on the animal. He thinks that, even in the age of Photoshop, pictures displayed Saturday will be convincing to people. Besides, Biscardi said, he has no doubt about the authenticity of this find. "I," he said, "touched the thing." Wellington, Aug 14 NZPA - A mountain guide in Prime Minister Helen Clark's alpine party has died near Lake Tekapo in the central South Island today. Police tonight confirmed the dead man was Gottlieb Otto Braun-Elwert, aged 59. Miss Clark is understood to have been involved in resuscitation efforts on him late this afternoon. Mr Braun-Elwert suffered what is believed to be a heart attack, Inspector Dave Gaskin, area commander for Mid-South Canterbury police said tonight. Miss Clark and Dr Davis were reported to be safe in a hut in a remote part of the Lake Tekapo region. Miss Clark's spokesman said there was no danger to Miss Clark or members of the party. Mr Braun-Elwert had an alpine recreation business based at Lake Tekapo and Miss Clark and her husband Peter Davis, keen mountain climbers and skiing enthusiasts, were regular clients of his. Search and Rescue volunteers have reached the hut in the Two Thumbs range in the South Canterbury back country and are preparing to evacuate the party, Mr Gaskin said. "Due to atrocious weather conditions a helicopter which was dispatched from Christchurch has been unable to reach the location," Mr Gaskin said. Mr Braun-Elwert, who had a degree in nuclear physics, immigrated to New Zealand in 1978. As well as taking Miss Clark and Dr Davis cross-country skiing several times, he guided them climbing in New Zealand and in South America. A member of Prime Minister Helen Clark's tramping party has died near Tekapo tonight. The Prime Minister tried unsuccessfully to resuscitate the person. Police have not yet released further details.